The date of Varaha Mihira is controversial, some say 100 BC others 500 AD. He was the first one to mention in his work Pancha Siddhantika that the ayanamsa, or the shifting of the equinox is 50.32 seconds. Varahamihira's other most important contribution is the encyclopedic Brihat-Samhita. It covers wide ranging subjects of human interest, including astrology, planetary movements, eclipses, rainfall, clouds, architecture, growth of crops, manufacture of perfume, matrimony, domestic relations, gems, pearls, and rituals. The volume expounds on gemstone evaluation criterion found in the Garuda Purana, and elaborates on the sacred Nine Pearls from the same text. It contains 106 chapters and is known as the "great compilation". He was also an astrologer. He wrote on all the three main branches of Jyotisha astrology: Brihat Jataka - is considered as one the five main treatises on Hindu astrology on horoscopy., Daivaigya Vallabha, Laghu Jataka, Yoga Yatra, Vivaha Patal. Some important trigonometric results attributed to Varahamihira. 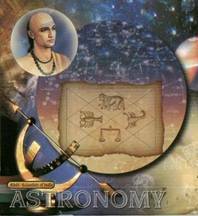 His son Prithuyasas also contributed in the Hindu astrology; his book "Hora Saara" is a famous book on horoscopy. Mihira was a Brahmana, the son of Aditya Dasa, from the region of Avanti, near present day Ujjain, in Western India. He was instructed in astrology by his father and was a devout worshipper of Surya Narayana, that is, Krsna who manifests as the Sun. By performing severe austerities to please Surya Narayana, Mihira got blessed with knowledge of ganita, hora, and samhita. Mihira was one of the Nine Gems, navaratna, in the court of the great king, Vikramaditya of Ujjain. He was greatly honored by the king for his vast learning and correct predictions. Once, after the birth of the King's son Mihira was asked to make predictions about the prince's future. Going into meditation after studying the chart Mihira "observed that a serious and irremediable danger beset the path of the longevity of the royal child and that he would be killed by a varaha, or boar, on a particular day in a certain month of his 18th year and no human remedies could save the prince from the jaws of death." Having learnt of this danger to his son from his most reliable of court astrologers, Vikramaditya consulted with Bhatti, his Chief Minister. It was decided that a special palace would be constructed with stupendous walls 80 feet high. Ten thousand elite troops would patrol both inside and outside the property as well as in the palace. Such careful watch was taken of the palace that not even a cat or rat could enter the compound what to speak of a wild boar. Every precaution was taken and the prince was under constant guard and practically under house arrest, he was not allowed to leave his compound for any reason. In fact he was ensconced on the seventh floor and not allowed to go to a lower floor. The precautions were so thorough that they boasted that the prince may die but certainly not by the agency of a varaha. After such security measures were put into place Mihira was asked if he would like to reconsider his former prediction. He emphatically stated that there was nothing that could save the boy. As the date grew near he was again asked to reconsider, and again gave the same reply. Tension began to mount, not so much for the sake of the boy but for the reputation of Mihira. His detractors thought that Mihira's reputation exceeded his ability, and though the boy might die, the possibility of it be caused by a boar was so remote that Mihira would be publicly disgraced. Even his friends, who had implicit faith in him and knew of his great abilities, had doubts as to how his prediction would be successful, because it was impossible for even a rat to move about undetected in that palace. On the fateful day Vikramaditya held court. Reports were brought to him every hour on the safety and health of the Prince, now 18 years old. All the chief pandits were assembled as well as the navaratnas, the nine greatly learned men, of the King's court. The whole city was waiting for the result of Mihira's prediction. Would it come true or not? The time of death had been fixed at 5:00 PM in the afternoon. The King, though a great admirer of Mihira, was beginning to doubt Mihira's abilities. With a condescending smile he addressed Mihira, did he still want to maintain his previous prediction that the boy should be killed by a wild boar this afternoon. Did any new calculation possibly change his mind, would the child just die, this was possible, but death by a wild boar would be impossible. The King suggested that Mihira gracefully back down from his former stance, without losing face. The King vowed that if the impossible happened he would give Mihira the highest honor and bestow on him the golden and be-jeweled Royal ensign or emblem, the Varaha, wild boar, that was currently on his crown and transfer it to Mihira's head-dress and that for posterity he would henceforth be given the title Varaha Mihira. Everyone applauded the King. All eyes focused on Mihira. He rose and gave a speech in which he deprecated his own learning, that unfortunately no great rishis such as Vasishta were present to reverse the karma of the Prince. He took a vow that if his prediction failed he would never practice astrology again, he would never enter the court of the king, and indeed, would leave Ujjain altogether and go deep into the forest to practice tapasya, austerities, till his last day. But Mihira stated that indeed the death would come true as predicted, there could be no thwarting of fate and the Prince would be killed by a boar. He then calmly sat down. In the afternoon at 2:00 PM the King again convened his court. Senior military commanders came every half hour with news of the Prince. He was hale and hearty. Everything was going smoothly. The King had given orders that the guard be on the highest alert and was confident that no harm could befall his son. But Mihiracarya was totally calm, how could this be so, in only a few hours his prediction would be proven wrong, yet he was still placid. Time went on, a half hour after the appointed time of death a guard reported that there was no disturbance in the Prince's palace. Mihira calmly told the King that the boy had already died at the appointed time and they should go see for themselves. Just then another guard came to report that all was still peaceful in the palace. On the way to the palace other guards confirmed that all was quite and calm at the palace. It was now about 6:00 PM and the King told Mihira that his prediction must have been wrong because nothing at all wrong had been reported, he couldn't believe that his officers were liars. Mihira replied: "Victorious Monarch! the prince has died at the hour, minute, and second, I have named and none of your watchmen has noticed it. It is a sad event no doubt but it has happened and your son is lying dead in a pool of blood, unnoticed by his watchmen and personal companions, and you will see the truth of my prediction. Let us go and examine." On entering the palace they noticed on every floor that peace and calm prevailed. On the 7th floor they found a dozen or so of the Prince's friends engaged in assorted games such as chess. When the Emperor made inquiries about the Prince, they all replied that he had been playing with them a little while ago and that he was quite hale and hearty and that he had just gone out to take some air on the open terrace of the 7th floor. Mihira said: "The Prince must be lying dead in a pool of blood caused by the injuries of a boar, and if you go to the terrace you will be shocked to find him dead as predicted by me. This wonderful prediction is not mine. My knowledge is too humble and too limited to make such inconceivable and surprising predictions. I have made all my predictions under the guidance of Surya Narayana. Could such predictions inspired under His grace ever fail?" They all went to the terrace and saw with horror and sorrow the Prince lying dead on a cot in pool of blood. He was disfigured by the iron hooves of the artificial boar-the Royal Emblem-that was attached to the flag staff. Everyone was thrown into simultaneous gloom and ecstasy by the successful prediction. Vikramaditya awarded Mihira with the Royal Emblem and he was hence forth called Varaha Mihira. The Prince's death had transpired in the following way. At about 4:00 PM, the Prince, who had been playing with his friends, began to feel a sort of oppression in his chest and giving over his cards to a nearby friend asked him to play in his place. He then rose without complaint and went out to the terrace. A tall flag staff, emblem of Royalty, rose high in the air, it had an artificial boar attached to its top. As this emblem of royalty was affixed to all important turrets and towers of all the Emperor's palaces no one took any notice of them. Near the flag staff was a cot with soft cushions for the Prince to take rest whenever he felt fatigued. The Prince feeling tired while playing games with his friends came to lay down in the cool air. At 5:00 PM precisely, a very strong gust of wind knocked loose the iron boar. This fell down onto the Prince who was lying on his back. The hooves struck severely against his breast and stomach and the tusks struck his head and mouth. The Prince lost copious amounts of blood and died immediately. The mattress on the cot absorbed the sound of the crash so no one heard it fall. And as the Prince would often go to the terrace, and as the game was very absorbing, no one noticed the Prince's absence.